What is a Classroom Repository? I love Google Classroom for so many reasons. How students and teachers and have discussions, share resources, give and receive feedback well beyond the walls and timeframe of the classroom and across all device platforms. One complaint I have received for a long time was that Classroom didn’t have a way to load a class module or template of already created posts, assignments, questions like Moodle, Blackboard or some of the other learning platforms. I was co-teaching in some science classrooms and they were voicing the issue on having to recreate assignments between peers. Sure, you could share attachments in Drive, but how could you share fully crafted assignments? Having every teacher be a co-teacher of each other’s classrooms was not the answer for many reasons. Then I thought of it…. I created a classroom called Archive Physical Sci Repository for Lessons (ok, the first was a little long) and another called Archive Biology Repository. 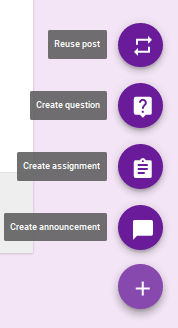 I set up and posted one announcement, that explained what the Repository classroom was for (sharing created assignments, questions or announcements between teachers of the same subject, grade or area) and directions on how to use it to add or pull content. Only teachers in that subject, grade or area (depending on what it was for) would be made co-teachers so the magical 20 teacher limit wouldn’t be an issue. To use a lesson from the Repository is simple, you do the same as using a lesson from an older Archived Classroom. Just go to the class that the lesson needs to go to, click the “RE-USE Post” button, choose the Repository class for that subject and pull in the assignment. To post assignments created back into the Repository requires just a few more detailed steps, clicking “Re-Use Post”, pull from their classroom, check off the “Create new attachments” box but then SAVE AS DRAFT. This isn’t really a classroom so there isn’t a reason to Assign or Post but more because if an assignment is posted/assigned, some edit options are no longer available for attachments. If you leave it as a draft, the person going to re-use it in their class can decide how they want to share the attachment, topic, and so forth. I had made the classes under a Google Admin account or Resource account so it would be the owner of the Repository classrooms instead of my individual account. Remember also that only 20 teachers can be added as co-teachers which is why we broke ours down by subject area instead of just by department. This ends up being a great way to share already crafted content between teachers, new staff, club leaders, or to create templates to share in other ways. With this step, classroom just got even better as a tool for educators. This entry was posted in Edtech, Google Apps/ GSuite. This entry was posted in Uncategorized and tagged IFTTT, YouTube. I recently tried out Form Publisher, a Google Forms Add-on to create reports from Google Forms Data. I have used Autocrat for years to create mail-merge reports from Google Forms but there were some limitations such as merging only from Google Documents and not Slides. It was also a bit complicated for most of the end-users I was training on it and would just stop working at times. Then I found Form Publisher. Form Publisher is an Add-on in the Forms add-on store. It will allow you to merge data filled out in a Google form to a template you custom design in either Google Documents, Sheets or Slides. Its pretty intuitive to set up too. You can also add as many editors to your merge job and change out your form as needed. The only downside is its only free for 100 reports/merges per month but the paid version is $36/year for unlimited reports for a Google Account with tech support included. I went to their site as well to learn more about the company and who was accessing my data. I was pleased to see the awesome team of Google App Scripts Developers who created Awesome Tables were the same team creating this new tool. It’s now easier than ever to experience VR. Finally, a way to express your love on Facebook.